Over 5 billion pizzas are eaten every year in the world. It is 30 billion dollar business, and more and more new pizzerias are opening. Why is pizza so popular? Probably, one of the reasons is that ‘pizza model’ is universal and extremely simple! No matter which country you go to, pizza looks similarly round, and pizzeria menu has the same structure everywhere. There are traditional all-time favorites like ‘Margherita’ or ‘Peperoni’, with some extra toppings offered for personal touch – simple and delicious! Over 100 million containers are shipped every year in the world, forming the backbone of current economy. However, shipping ‘menu’ – unlike pizzeria’s – is extremely complicated, with each logistics service provider adding own unique complexity to the pricing structure. Imagine now you are in a pizzeria, and to get the menu is taking hours! Price list is prepared manually upon request, individually for each table. And you can never be sure that you are charged correctly – according to statistics, every 10th invoice is wrong. Well, this is the reality of container shipping. You might say that pizzeria has nothing to do with shipping, but actually both of them share the same model. 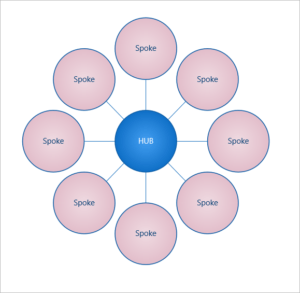 The model is called ‘Hub and Spoke’, named after a wire wheel. The classic form of this business model is seen in the aviation industry: each airline has a hub airport, used as the base for operations. Airline provides a number of regular connections, some ‘unusual’ connections at higher prices and presents a list of additional paid services for passengers. The wire-wheel consists of many different parts and internal links, but in the end everything is interconnected and spinning. Great advantage of this model is that the pricing can be highly accurate. The product is consistent, because there are no individual variations. Shipping industry is the pioneer of hub and spoke: large ship takes container to hub port, small ship takes it to small port and truck delivers it to the client. Must be simple and efficient, right? Operationally – yes, but not commercially. Commercially, each mode of transport for this container is a complex calculation in itself – it consists of various surcharges, special terms, seasonal add-ons and individually negotiated charges. The worst part – freight rates change weekly. At this point, container shipping loses the efficiency and creates long lines of unhappy clients, waiting for freight rates. At the attempt to solve the problem, many companies try to digitize freight pricing and quoting process ‘as is’, which does not bring the expected result – as the digitization of freight does not make it automated. 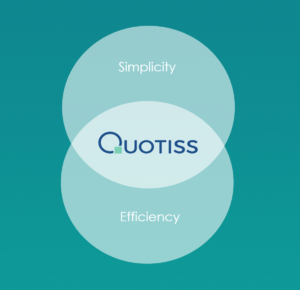 At first, it seems there is no way to automate freight rates, but at Quotiss we found the solution! Quotiss presents the first software for container shipping where ‘Hub and Spoke’ model is used for freight rate management from A to Z. It is so efficient, that it literally takes couple of seconds to generate and send offer to the client. We prove that freight complexity can be reduced by 99%, following the patterns discovered by Pareto 100 years ago. Quotiss can generate 100% accurate quotes in a few seconds. It’s easy to use, tailored to the freight forwarding business and brings structure to the commercial process. Quotiss is created by logistics professionals for logistics professionals. Contact us to schedule a demo – we will show you how to get your sales under control!